Buying presents can be a stressful business and being stuck for Christmas gift ideas adds pressure and worry at a time when you should be relaxing and celebrating. Are you struggling to find a gift for someone who has all they need? Tired of buying the same items year after year? Ensuring you find the right goodies is trickier than it seems, especially for those who are impossible to buy for. Or so you thought. Enter the personalised gift. Both thoughtful and original, you don’t have to spend a lot to go a long way. Keep their presents as unique and exclusive as they are to you. High Street retailer Ryman Stationery have a huge selection of personalised stationery, diaries and gifts and it’s never been a better time to make your gift ideas individual. 6. Watch them unwrap their perfect, personalised present and make their Christmas extra special. With Christmas just around the corner, we’ve put together a selection of our favourite personalised products, so you can find beautiful, bespoke presents. Et, voila! Give mum an adorable keepsake this Christmas with the Ryman Personalised M is for Mummy Mug (£8.99). Add your initial and name to the back of the mug so she’ll always have a reminder of her most special person, all year round. Give Dad a year off the slippers and treat him to something a bit more individual. Remind him just how golfing mad he really is with this Ryman Personalised Golfing Dad Mug (£8.99), so he can dream of the tee, whilst drinking tea. Take your favourite drink with you on the go with this Ryman Personalised Floral Drinks Bottle (£12.99). Your name is surrounded by a beautiful spray of pink and blue flowers so not only will this stand out from the crowd, you’ll be guaranteed nobody mistakes it for their own! Ideal for travelling, taking to the gym or keeping you hydrated at work. Got a teacher you adore? Show them your appreciation for all that they do with this fabulous Ryman Personalised Paint Spots Teacher Name Mug (£8.99 reduced to £6.29) so that they be the envy of the staffroom. Why not add the Ryman Personalised Paint Spots Teacher Name Coaster (£5.99) too, for a perfect brew. For the person who adores putting pen to paper, this Personalised Engraved Parker IM Fountain Pen Gold Trim (£46.99) makes an ideal gift or luxurious stocking filler. Suitable for everyday use, engrave this stunning pen with the name of your choice and let their inner novelist shine forth. Never lose your PE kit again with this Ryman Personalised Drawstring PE Gym Bag (£12.99). Additionally, why not double up at Christmas and use as a personalised Santa’s sack to store all of their goodies in? Got a comic book character in your house? Send them off to school with the Ryman Personalise Comic Large Pencil Tin (£13.99). Ideal for holding their pens and pencils together, with an extra dash of superhero power. Give them a boost of morale during exams with this Ryman Personalised Pretty Font Clear Pencil Case Black Zip (£7.99)? Alternatively, it’s perfect as a make-up bag and will guarantee they never mistake their lippy for yours! All together now. The Ryman Personalised Soft Cover Medium Notebook The Journal in Copper Foil (£14.99) is the ideal Christmas gift for the family who have everything. Help them keep home-life organised, this would look gorgeous displayed on a hallway table. No more excuses for missing important to-dos! Sometimes words aren’t enough but all that changes with this gorgeous Ryman Personalised Mounted Frame To The Moon and Back (£15.99). Add your loved-one’s name and express just how much they mean to you. Not only will it adorn their walls, but they’ll remember your affection every day. 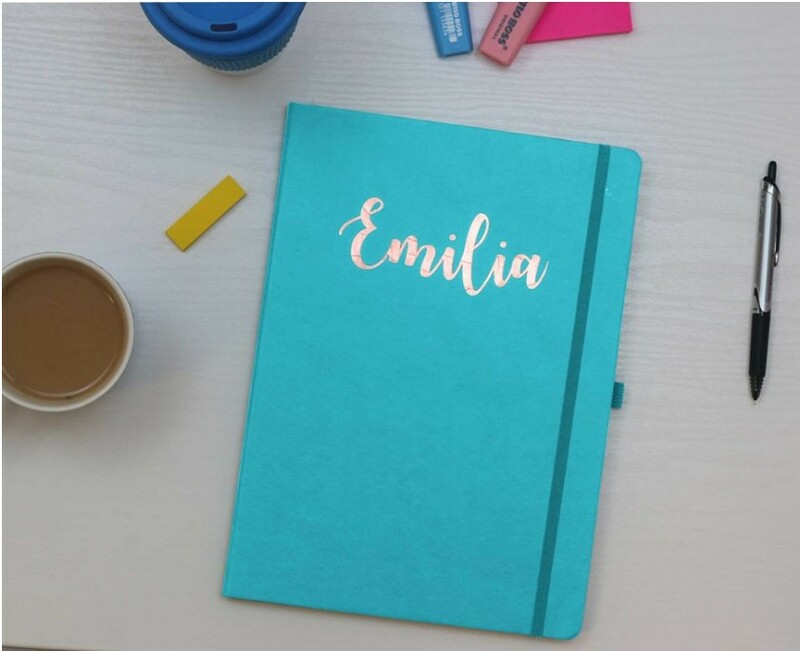 For an 80s child who loves jotting things down, why not treat them to this Ryman Personalised Soft Cover Medium Notebook 80s Font in Silver Foil (£14.99)? Featuring a 1980s style font, personalise the notebook to suit the recipient perfectly. Ideal for jotting down recipes, to-do lists or for use as a personal journal. Need a wedding present to go the distance? This Ryman Personalised Happy Ever After Frame (£15.99) is a wonderful way to remind your lovebirds of their most special day, forever and ever. Bestow your gifts with that added bit of oomph, and indulge them with a Personalised Luxury Large Gift Bag with Engraved Gold Plate (£6.99)? The gold plate can be personalised with any name or message, holding up to 80 characters, so they’re guaranteed an extra special surprise. Make unwrapping goodies from underneath the tree extra special this year with the Ryman Personalised Wrapping Paper Christmas Collage 1 Metre (£6.49). Little ones will be so excited that Father Christmas has included their names on his delivered gifts, it will add a touch of magic to your special day. Media information provided by Famous Publicity. For further information please contact Josh Balmer at josh@famouspublicity.com or Steven Hanlon at steven@famouspublicity.com or Tina Fotherby at tina@famouspublicity.com or call the office on 0333 344 2341. This press release was distributed by ResponseSource Press Release Wire on behalf of Ryman Stationery in the following categories: Children & Teenagers, Men's Interest, Entertainment & Arts, Leisure & Hobbies, Home & Garden, Women's Interest & Beauty, Consumer Technology, Media & Marketing, Retail & Fashion, for more information visit https://pressreleasewire.responsesource.com/about.